Player Series humbucking pickups sound huge and warm, while the Player Series single-coil middle pickup is crisp and articulate, delivering authentic Fender tone with a modern edge. The “Modern C” neck compliments any playing style, and looks great with smooth maple contours. A 22nd medium jumbo fret added to the 9.5”-radius fingerboard makes it easier to express yourself musically. An updated 2-point tremolo design has smoother travel for enhanced playing feel while simultaneously delivering rock-solid tuning stability. 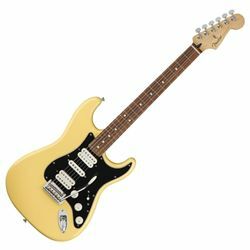 This one's also got master volume and tone controls, a 5-way pickup switch, synthetic bone nut, dual-wing string tree, sealed tuning machines and four-bolt “F”-stamped neck plate that marks this instrument as the real deal—as Fender as it gets.